If a milk tooth comes loose, that is good news! That means a tooth fairy will soon be visiting and bringing a beautiful gift. On the other hand, loosening of permanent teeth is bad news. As a result of Loosening of teeth, biting and chewing becomes painful, or even impossible in some cases. Unless treated immediately, teeth will either fall out ultimately, or chewing will become so difficult that the teeth may have to be removed anyway. You stand to lose your tooth in either case, that is, if you do don’t visit the dentist immediately. Why does a tooth come loose? Periodontal Disease – The most frequent reason for loosened teeth is periodontal disease. In this disease, gums and/or bone tissues that surround and hold your teeth in place get infected with bacteria. The root cause of gum and periodontal problems is poor oral hygiene maintenance. Plaque builds and harbors bacteria which cause infection of the gums. It starts with inflammation of the gums, but if not treated, the gum starts loosening detaching. Bacteria gain entry into the pocket so formed, flourish there, and cause further disease. Your immune system reacts, and as a collateral damage gum flesh and the supporting bone are lost gradually. This results in loosened teeth. Unless treated immediately, teeth may eventually be lost. Parafunctional Habits – Habitual grinding and clenching can be another possible cause in some people. Periodontal ligaments supporting the teeth within the jaw bone get weakened due to excessive forces and the teeth become loose. Of course, grinding will cause teeth to wear out also. 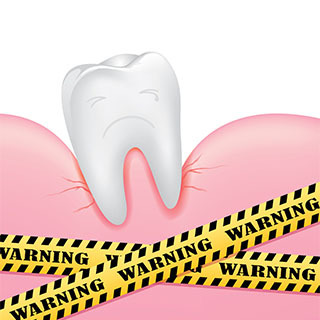 Improper Bite – An improper bite (uneven mating of upper and lower teeth) can also cause localized stresses and cause teeth to loosen. Trauma – Occasionally, teeth may come loose as a result of trauma during support or some accident. What are the Treatment Option for Loose Teeth? Treatment of loosening teeth is also according to the cause of the problem. Let’s have a look at the various treatment options available for treatment of loose teeth. Strict Oral Hygiene Maintenance – Control of gum disease requires a joint action by the patient and the dentist. You must ensure good regular oral hygiene, and adherence to instructions by the dentist. Our dentists at Barnaby Square Dental will thoroughly clean your teeth and remove plaque and any tartar (hardened plaque, also called calculus) deposits from root surfaces under the gums. This procedure is called ‘deep’ cleaning. Our dentists will also give you advice on how to make your oral hygiene at home more effective. These measures will often result in an improvement in the gum condition and tightening of the teeth to some extent. 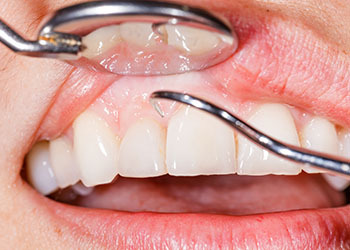 Treatment of Bite Problems – In case of a poor bite causing the problem, a mechanical approach is required to modify the forces on the gum ligaments. The exact remedy will depend on each case. In some cases, occlusal (bite) improvement obtained through removing tiny amounts of enamel from excessively raised portions of tooth crowns. This redistributes the forces more evenly and may reduce the stress on the teeth. Restoration of worn out teeth and replacement of broken / chipped fillings will also have a positive effect. Teeth Splinting – Redistribution of biting forces is also possible in some case through splinting together (temporary or permanent) of teeth. In this way, biting forces are shared between the splinted teeth, and there are less chances of further loosening of the teeth. Management of Parafunctional Habits – Where the problem of loosening teeth is attributable to habitual grinding or clenching of teeth, a custom-made bite-guard is the best solution. It can be worn when one is likely to succumb to this habit, e.g., during the night or at times of stress. The bite guard is also useful against excessive wear to the teeth. Which remedy is the best for you, can only be determined by a qualified dentist after a thorough examination and discussion with you. The best you can do is to immediately step up your oral hygiene, and seek an appointment with your dentist. ‘A stich in time can save nine’, but a delay can cost heavily, in addition to losing your natural teeth. If you have loose teeth that make eating and speaking difficult for you, then you must visit Barnaby Square Dental in Brookhaven, GA. Our expert dentists are there to take care of all your dental problems.